Crime dropped in Los Angeles in every major category in the city in 2018, Los Angeles Mayor Eric Garcetti announced today. Homicides were down 8.2 percent, violent crime was down 4.5 percent and property crime was down 1.8 percent. Homicides totaled 259, down from 282 in 2017. 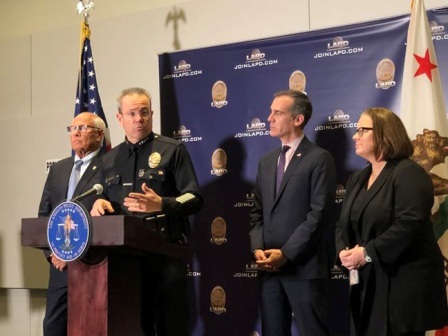 Garcetti, joined by Los Angeles Police Department Chief Michel Moore and Police Commission President Steve Soborff, credited an increase in patrol hours and an expansion of an anti-gang initiative called GRYD as key reasons for the reductions. “This was the second-lowest number of homicides that we’ve had in over 50 years, and when you compare to how it looked in 1992, a year of turbulence and unrest here, it's pretty remarkable. Violent crime is down 67 percent since then,” Garcetti said, referring to the 1,092 homicides recorded in 1992. Garcetti noted that the department added more than a million patrol hours in 2018 without adding significantly to the number of sworn officers, which increased slightly from 10,029 officers to 10,040. About half of the increase in patrols was due to the LAPD taking over patrol of Metro trains and buses within the city from the Los Angeles County Sheriff’s Department mid-way through 2017, making 2018 the first full year of the new deployment. The other half of the increased patrol hours was the result of a new focus on moving more officers out of administrative roles and back into regular patrols, which Garcetti said was the result of “being smarter and using overtime and putting this into my budget” in order to get more officers out on the streets.